This is the ideal dish to make if you have leftovers! Allow about 30 minutes to prepare and cook assuming you have your stuffing already. You don't need to stuff them with leftover risotto, you can use other leftovers or even some bolognese sauce. You will need to cut the peppers in half carefully down the middle leaving the stalk in place as in the picture below. You should also clear away any seeds from the inside leaving it clean. Blanch the peppers for a couple of minutes in a pan with boiling water. Remove from pan, remove excess water and stuff the insides of both pepper halves with the risotto. Then add a couple of slices of anchovy in each on top of the risotto and then top with mozzarella slices. 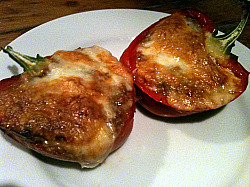 Place pepper halves in an oven proof dish and bake in the oven for about 15 minutes until peppers are soft and cheese has melted and become golden. Serve with a drizle of olive oil and side garnish if serving as an antipasto. Let your imagination run wild with whatever filling you like!